The following journal excerpts are drawn from a Masters research project regarding identity, the body, architecture, and territorialisation. The work was undertaken as part of a Masters in Therapeutic Arts Practice at the Melbourne Institute of Experiential and Creative Art Therapy. July 2018: ‘Practice, Method, Frame’, and Intersubjective Response to ‘Arts Informed Research’ by A.L. Cole and J.G. Knowles, Chapter 5, Handbook of the Arts in Qualitative Research, SAGE Publications, London, 2008. The content of this piece emerges from a space of curiosity regarding the body in proximity to architectural structures and exploring emergent felt-senses within such framing. The site is Athens, Greece, as shot in July 2018. The moving image and repetitive shifts represent the importance of arriving at arts-based research with coherence of practice, consistency of method, and a capacity for framing the findings within research boundaries. Fear: Examining the fear, what is the fear telling us? The representation/ISR I make is below. The Words ‘Uncovering forgotten history’ emerged as a title of the work. Creating the representation was challenging as it has made me aware of how much is unknown. 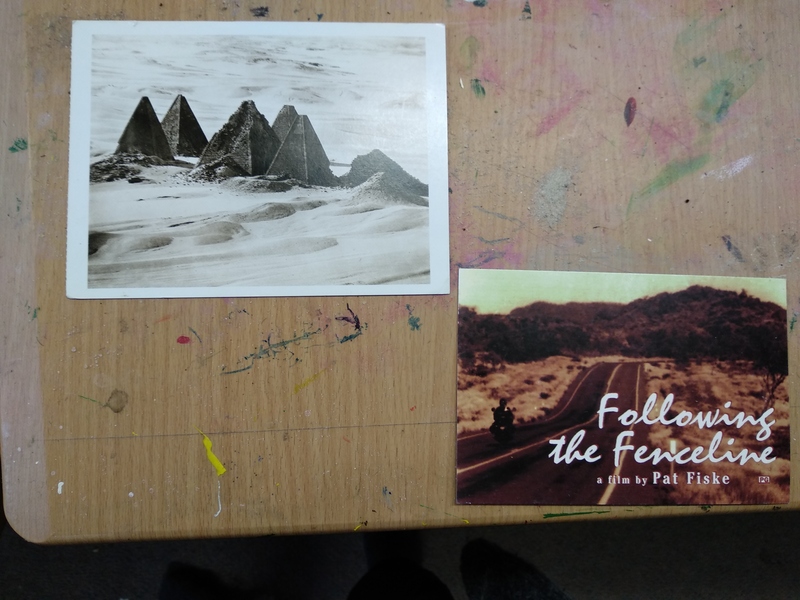 The post cards frame being unstable and unblaanced within the frame I was trying to create felt like content-in-process as one of my challenges in grappling with the subjects of history and mapping/lines as shown in the images. ‘I am a holder of secrets. An attempted erasure, inhabiting stories imposed. My inquiry is to write my own story. No one can tell the wood how to wear its grains; no one can tell the wood how its grains are worn. Walking forward to your past. Uncovering. Shape of you within it. Continual construction and deconstruction of form. Key words: Focusing on the key words that attracted me t the post card as a sign for how the representation might like to unfold. Pausing: Many times of doubt and dissonance emerged during the making, and I paused frequently to stay with the feelings and to allow presence. ISR: Rather than using the postcards in the representation, I intersubjectively responded to the images to create the representation. Dialoguing: When feeling lost about how to proceed, I dialogued with the representation to identify what elements were most important and what was really necessary for each element to feel fully expressed. Slowing down and reflecting on how things emerge. Noticing the moments of changes in choices. 2) Procedural content-in-process – moments that stand out as significant and in which we make a decision or choice. The exercise for today’s session was to inquire into the ideas put forward by the following key paragraphs selected from reading Elizabeth Grosz’ ‘Chaos, Territory & Art: Deleusze and the Framing of the Earth’, Chapter 2: Art and Architecture, by responding to and interacting with a wall (i.e. an architectural form as partition). Specifically, I wanted to inquire into the idea of territory, and the felt sense of territory as articulated in the reading. This is why the frame’s most elementary form is the partition, whether wall or screen, that, projected downward, generates the smoothness of a floor, that “rarefies” and smooths over the surface of the earth, creating a first (human) territorialization (p.13). The partition projected forward induces the wall, which constitutes the possibility of an inside and an outside, dividing the inhabitable from the natural (the chaotic), transform- ing the earth itself into a delimitable space, a shelter or home. The wall divides us from the world, on one side, and creates another world, a constructed and framed world, on its other side. Though it primarily divides, the wall also provides new connections, new rela- tions, social and interpersonal relations, with those on its other side (“The wall is the basis of our co-existence” [Cache 1995:24]) (p.13). In this process of territorialization, deterritorialization, and reterritorialization, the body becomes in- timately connected to and informed by the peristaltic movements, systole and diastole, contraction and expansion, of the universe it- self. Body and universe, entwined in mutual concavity/convexity, floating/falling, folding/unfolding are directly touched by that out- side now enframed, creating sensation from their coming together. (p.13). In undertaking the exercise, I sought to record my interaction with the wall, but the wall I found felt overshadowed and the light was too poor for recording. On the opposite side of the driveway, however, I found that the afternoon light had lit up a wall and became enamoured with the interaction of my shadow against that wall. This emergent curiosity felt to me to animate some of the ideas that had been put forward in Grosz, especially regarding the exchange between the body and architecture. I then moved the camera to be able to record the opposing wall and my shadows upon it. As I commenced moving, I realised that there were words and sentences that I wanted to speak, so I promptly stopped and attached a microphone to myself before proceeding the exploration. During the exploration, I could feel that the ISR’s of my words were of direct relevance to the inquiry, and that the interaction of my body with the wall through the shadows that it was creating was also an emergent form of dialoguing with the wall. When the exploration felt to come to a natural close, I went to the camera only to find that my battery had died and failed to capture my interaction. I was very frustrated by this outcome, but grateful that I had recorded the words that I was speaking and not relied on the video. This is when I realised that working multi-modally meant that perhaps the failure of the camera and the parallel use of the recording had worked as a reduction to the key elements or distillation of the key messaging. This felt like a moment of content-in-process. ‘I feel it first in my face. I feel it first in my face. It’s a sense of resistance. The thing about walking towards a wall, is your consciousness of the space being finite. I know there is an end to where I can go, which controls how I am willing to move here. I might fold before I would normally fold. There is something asymptotic about my desire to engage. I don’t want to touch it, even though this magnetism of my finitude, so there is intimacy. Some sort of organic, reflective, sense. But it is finite. I know that I am limited. So the expansion can happen this way, but not this way. Here, I contract. Relationship becomes cyclical, then. Can only be in this certain rhythm. We are given planes within which we can interact with each other, here. Here. Again, this intimacy is conjured. The rhythm is here, and here. Everything else pivots. There is a loneliness here. An isolation. Everything ends here. It reduces me, it reduces my dimension. It is reductive. Asymptotic. It changes my shadow and allows me a particular perspective on myself. Augmented, symbolic. But I feel it most in my face. It is cold. And somehow, empty. It has nothing to say to me. Or does it? I can’t help but feel like this division, here, is only me against myself. Approaching the table of my work during supervision, my first sense is that my work is ‘deconstructed’. I think it is not a neat or recognisable whole. And yet the thing that binds it together is the idea, the Inquiry itself is the work/the practice/the outcome. As I present the work I notice that there are multiple parts of this that are suspended within me. It feels like the three distinct parts: the video, the recording, and this ongoing live energy of motion within myself that seeks to test the boundaries. It brings to mind now that I am writing, a question that came to me in the evening: what are boundaries made of? Perhaps this speaks to something of the inquiry. Moving through other people’s presentations, the questions that arise in myself in relation to the work regard the relationship between these various suspended data. I also find myself curious and keen to depict the subject-matter in a physical form that I can observe, be with, interact with (clay comes to mind, or sculpture). I feel a strong sense of the unknown in myself, a desire to want to reengage with the wall and the sensations. Physically I feel almost a flatness or nothingness in my chest. I am calm but simultaneously wonder about an absence of energy within the frame of my inquiry, and feel the desire to (or the self consciousness about) the lacking of this ‘spark’ or ‘fire’ in my work. The other side of this self-consciousness is a sense of being with what is there – being with this flatness, treating it like a boundary or wall and exploring its properties and sensations, seeing what it has to offer me. Looking at my charcoal representation based on our initial focusing exercise regarding the work we have made, I am drawn to move in my body, and also identify for myself that part of understanding my sense of territorialisation must also be to experiment with my body in the absence of architecture/boundaries – or perhaps in an architecture of expansiveness, so that I know what exists in opposition/alternate to my response/sensations to the wall. The ISR I received was an invitation to reengage the Wall as a place of dialogue, rather than as a passive object in my inquiry. Receiving the ISR was a very strong moment of resonance for me. I immediately felt a sense of apology in myself. I felt sorry to the wall (Wall) that I had discounted it’s presence in my inquiry and instead seen that I was alone or unanchored in this process. My companion based her ISR by bracketing in a previous subject in which I had made small eyes and a mouths and ears in order to remember and articulate that all things in our environment had speech, something to say, if we are to listen. I wish to reintroduce this. I feel I have a companion in the wall. It also brought to mind ideas of dimensionality and the wall as a friend rather than as an oppressor as I have preconceived ideas about. Resonant lines from one of my supervisors? (What if time is your friend? What are the spaces between the thoughts? Rest there.) Inquire into your own arts practice. Consider procedures to lead you through/out/in. Exercise 2: Dialoguing with the wall. Reflecting on the postcards it occurs to me that this inquiry regards myself and form. What then is the significance of the wall? A force/plane upon which to define myself. The idea that the Wall I was interacting with was also ‘live’ and not necessarily in opposition to me, but also in support of me, was a resonant moment. An exercise that emerged from this was to Dialogue with the Wall. The shape on the tile makes me aware of the waves of energy that exist before and through the walls. At 1:23 I realise the camera is showing me the ‘sight’ of the wall. I start mirroring the body language and it occurs to me from then on that the walls can see. I am dancing in performance for the wall and for what I feel the wall can see. I am dancing for and with the wall. Is the wall an extension of myself? Seeking to amplify these interactions even further, I choose to respond with the wall again and have the interaction recorded. Initially there is a sense of trepidation in myself. I look at the eyes and feel as though I am interacting with another person and therefore must be aware of their sensory needs. But as I begin to touch the wall, the smooth and linear surface asks me to glide upon it. The eyes begin to reflect a flirtation or charm, moreso, an intimacy that allows me total freedom. I let the lines of the wall guide my body and the support makes my movements feel fluid and easy. I explore the different planes and the gestures and positions of my hand make me realise that the framing of the eyes and its symmetry with myself starts to make me recognise it as a likeness. At 2:06 I start to cover the eyes on the wall, just as I had previously with the photographs. I realise this to be a motif of mine: covering my own eye and that of the wall. There is a sense of mirroring that happens, although simultaneously it is a feeling of evenness – of distributing the power and vulnerability between myself and the Wall, to show we are both vulnerable to each other. This sense occurs again at 2:50 when I touch what would be the ‘nose’ of the face on the Wall, and then feel to touch my own nose. Turning away from the Wall I simultaneously realise that the eyes are there as a reminder, but the Wall exists beyond the eyes and continues across the plane. Throughout, I notice intimacy, a seduction and flirtation. A wanting to be ‘with’. Looking back through both the photos and video, I realise there are some moments that are truly live and the framing highlights a beautiful choreography and movement of the body. In my next art making session I have a desire to draw these shapes that resonate with me, look deeper into what my body is saying, and why these moments resonate. I am reminded often of a line from a show I saw in Venice called ‘Dancing With Myself’. This exercise, with the Wall, and even further enhanced with my partner videoing me, makes me think that all the eyes that see us are the eyes of ourselves. That we are actually dancing with ourselves all the time, and that our awareness of that and what expectations or judgments we bring are also those we inter-subjectively project onto the audience. As I come to the Inquiry today the first thing I think about is the images and a deep desire to put all the data together and look at it again. Pulling up the images, I first reduce them by clustering them digitally, deleting those that do not resonate and titling them into file groups. My initial images of a structure in ruins and a framed image of myself, in relation to the data I have produced, illustrates a likeness to some of the images in that the shapes I make with my body are also architectural, and made of lines. I start to feel that the external images I had chosen are really about internal structures/mechanisms/states that I carry within myself. Looking at this data and clusters, the following ISR comes out in recorded form. I write them and put the key words in bold. Looking at the collection of work now, of data, including the initial words of “I am a forgotten history” and “I am an unwritten story”, as well as Elizabeth Grosz’s statement that art is a way of framing chaos, I am looking at this data and I simultaneously feel that I am dancing with myself as I am dancing with an other. I notice throughout the photographs and even in the movement, there are these moments where I seem to be seeking connection with this anonymous other, or whatever it is I feel in relation to the wall, and yet at the same time I become aware of some sense of how I am moving outwardly. Wanting to push my body through space outwardly and yet somehow symbiotically in relationship with whatever self it is I see in these eyes on the wall. When I think about the initial words and the inquiry: “I am a forgotten history. I am an unwritten story”, what this exercise starts to make me feel sort of overwhelmed by is that there is this chaos from which these movements and relations emerge from, but simultaneously there are these histories that are carried within our bodies and so in a way starting to find new frames, or new ways of framing those histories, starts to create new understandings from the chaos, rather than allowing histories to remain locked in histories, or to the past, in a way meaning that those patterns or knowledges cannot be unearthed or changed, that they are sort of fixed whether they are positive or negative for you but looking at it in light of the unwritten nature of chaos, suddenly a history is just an alphabet. I look at these images and whilst I can see emotive qualities, what I can also see when they are quite abstracted is a choreography – shapes, lines – and so I guess my curiosity is how does a forgotten history and an unwritten story intersect through my framing? I sum up my question as follows: How does a forgotten history and an unwritten story intersect through my framing? This is also a form of reduction. I collect the data in my scrapbook and start to realise that the clusters are the beginnings of a choreographic language, or tools, with which to create works or to frame. The companioning sessions during the supervision have a significant impact on me. As I go through the clusters I have created I feel a ‘deadness’ in them. I feel as though I have rushed them, tried too quickly to put them into a box and make them ‘something’ and not allowed for them to speak and be what they truly want to be. My companion in the trio talks with me as I explain to her how I am trying to articulate a choreographic language so that I can bring some order to the sense of overwhelm caused by the realisation that there are infinite shapes in my body and an infinite number of stories which can be told. She asks me which of the images I feel most drawn to, and strangely I choose one of my face that has been put in the ‘cull’ pile – not the clusters. I tell her I like this image because it feels ‘honest’, and not constructed like the others are; because I am not so focused on ‘doing’ rather than being. As I speak to her we realise that we are experiencing content in process: I am complaining to her that I need a way to bring order and system into my approach to my inquiry, but simultaneously I feel drawn to the one that does not neatly belong to the order I have attempted to enforce. I tell her that I am frustrated that I put my images into clusters so quickly and that I often rush into order and lose the essence of the inquiry. We laugh together at how this has unfolded. Coming home after the supervision session, I return to the book in which I have pasted the images and cut and tear them out into cards. I start to instinctively create representations with them as follows. Ideas begin to emerge and I jot them into the margins. I notice new shapes in the shapes within myself. It appears as though I am giving birth to these places, simultaneously to their emergence from me. I enjoy the strangeness, seeing new lines and configurations within the architecture of my own body. It returns me to my initial thoughts regarding architecture and it’s relationship to the body, and through these images and augmenting their positioning I can see how we create architectures for ourselves to dwell within, enforcing stories in relationship to our own body. When I rip the old images out to create the collage, some of the images tear. Using these I start to play with those images of my face and am drawn to the following. Something happens when I see myself seeing myself seeing myself. As I see selves within myself looking forwards into that self that is creating, it conjures a gentleness in me. A vulnerability. It makes me reflect on my earlier notions of the viewer (who is the viewer? Is it not I imposing my judgments on how the viewer views?). It also makes me think of history. Of the history of selves stored within me that look forward towards what I will do next; that are simultaneously observers as they are creators. i try to see this in a frame, whereby my face, my neck frames my own face. In effect, I frame myself through a tear created accidentally. All this would have never come about had I not ripped the images from my book, frustrated at the forced order to which I had assumed of my form. Later, discussing with my partner, he mentions a resonant line from Hindu philosophy. In the Hindu map of creation, Purusha is consciousness experiencing itself, and Prakriti is primal creative energy/material potential. Over the last few days I have been thinking and mulling over the images and how they relate to my initial inquiry intention. Leaving them for a few days, they start to become less alive and I feel stuck. Then late the other night, I decided to gaze upn them again, and surrendered to my desire to take the images and cut them out. I wanted to see the bodies alone. 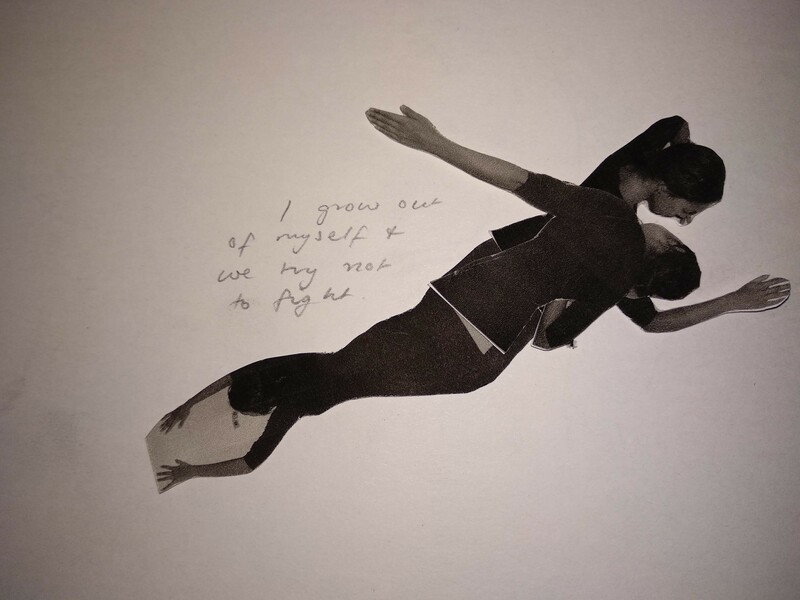 To move them and to have them form new spaces, again bracketing in the notion of myself = ‘giving birth’ to myself, my body finding the new shapes from within. What becomes of the spaces between us? I inform my surroundings inform me..
Pondering this, I start to notice the cardboard cutouts and the lines of the bodies, but also the lines created by cutting them out against the cardboard. These lines that fit so well together with the other side of the body. I start to ask about this ‘negative space’, that made the cut outs and the bodies still appear so related to itself across the blank page. I then start to cut out more bodies from other images, Arranging them, the shapes created remind me of mountains and landscape. I am amazed that such an accurate description of mountains could be drawn by these shapes in mybody, when to draw them freehand would perhaps be not as accurate as the lines caused by the contours of my body and negative space. My body joines with its negative spaces and creates a landscape. 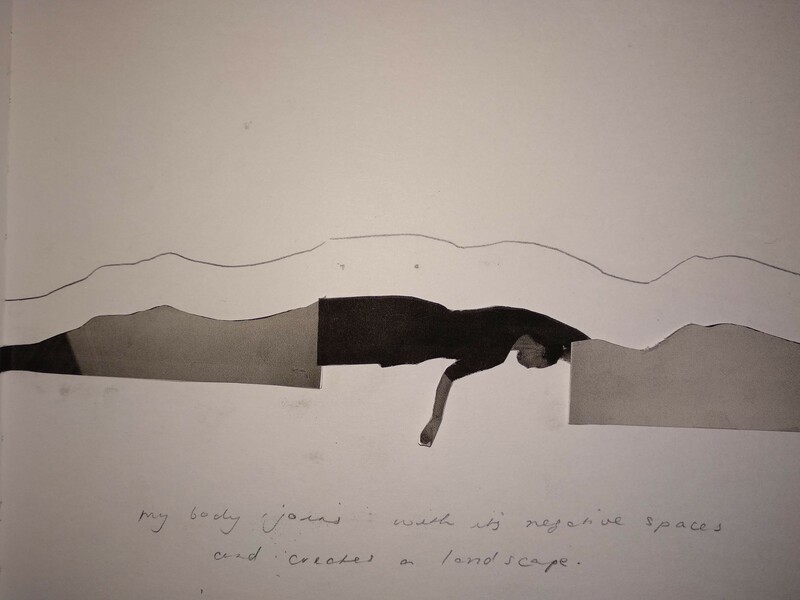 I draw the emerging landscape in pencil, tracing the shapes of my body+negative space together. I space them apart, attempting to articulate the relationship visually. I grow out of myself and we try not to fight. I reflect that this is a dear metaphor to the ways in which the various aspects of ourselves can come into conflict, and into harmony, not dissimilarly to my inital interactions with the wall where the wall first felt oppressive and resistant to me, then felt freeing, close to and supportive of me. There is something I feel physically in my body in observing this friction. Even to look at this image I can feel myself upon my shoulder. It is one thing to say ‘I am everywhere’ or ‘I am a part of everything’. It is different to feel yourself being touched by yourself and sensing a presence puncturing time and space. The partition transforms the earth into a delimitable space. Though it primarily divides, the wall also provies new ways of relation. In this process of territorialization, deterritorialization and reterritorialization, the body becomes intimately connected to and informed by the peristaltic movements of the universe itself. Body and universe entwined in mutual concavity/convexity, floating/falling, folding/unfolding are directly touched by that outside now enframed. *The frame is what establishes territory out of the chaos that is the earth. *This is why the frame’s most elementary form is the partition, whether wall or screen, that, projected downward, generates the smoothness of a floor, that “rarefies” and smooths over the surface of the earth, creating a first (human) territorialization. *The first gesture of art, its metaphysical condition and universal expression, is the construction or the fabricaiton of the frame. *It is the architectural force of framing that liberates the qualities of objects or events that come to constitute the substance, the matter, of the art-work. The frame is what establishes territory out of the chaos that is the earth. I sit and reflect upon their meaning. Curious to delve back into some of the images, I print out images and start to cut them out to again experiment with collages. Running out of time I go to pack up, and putting together the cut up papers of the’negative spaces’ left over from my body outline, I am drawn to their appearance layering over each other and creating a live and undulating (or “peristaltic”) sky. This stays with me and is live. I return to the inquiry with the intention of returning to the collages to devise a final presentation. However, as I pull out the cut outs of my body, I find myself more drawn to the other side of the cut outs that don’t contain my body, and the shapes that they make. I emergently responded to the sense of wanting to put them together and as I do I realize that the lines are fitting together in a way that makes them feel related. The lines of my body, creating new with each other, that feel resonant but also new. It is unknown but familiar. The images start to form and I take photographs as I go, wanting to turn it into a film at some stage, however as I work I realise I want to speak and I respond by adding a microphone to my top. A significant series of content-in-process moments emerge. The most important of these moments occurs when as I am working with the paper to collage, I find I cannot physically weigh them down as I arrange them, and I seek out an old frame from which I remove the glass and use the glass as both a weight and a way to frame the new images. This becomes a highly resonant moment, acting as a metaphor of how an ‘old’ frame or a former shape, can not only be utilised, but is critical to the development of a new frame or a new shape. I’ve been trying to make something of the body. To understand it us the shapes that it shows me. I cut the shapes, I rearrange them, I layer them and see my own face counselling my own face. I try and settle them so I can see them clearly, and I can’t do so until there is a frame. 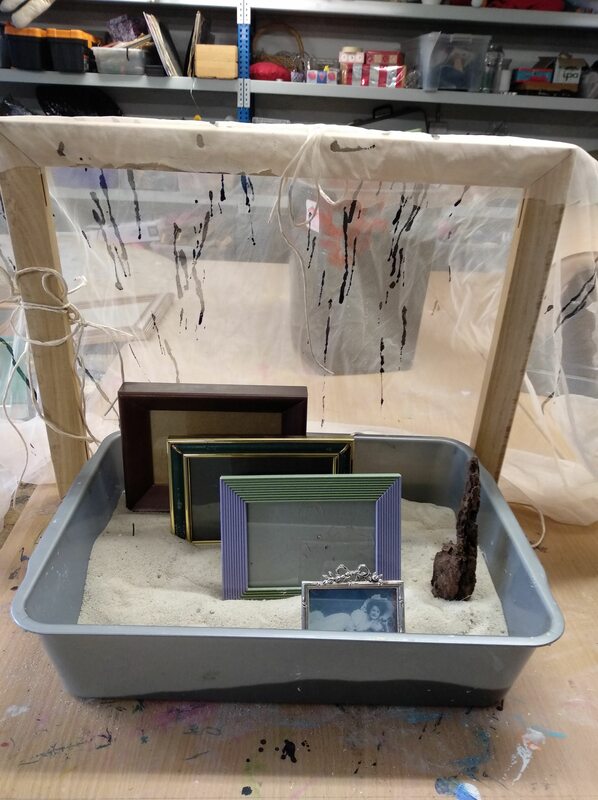 I simply remove the glass from an old frame, and then I can create something new. But sometimes I think I cannot. I keep wanting to stop this recording, as though what I am saying isn’t wise enough to be heard, or that it isn’t worthy, it isn’t profound. But, on the contrary, I think there is something profound about the shapes that we make and more importantly as I look at these mountains, skies, pieces of paper, the negative spaces from my body, and from cutting it out of the shape that I know, it creates something. And I can’t deny it or change what it wants to be. All I can do, is frame it in a way that let’s me understand or that allows me to see it anew. It’s all these little jagged lines, they’re so alive. And then I look out at the linearity of my window, of the rooves, I look out at this and I wonder how I could have come from it, how I could have found myself in all of these lines after I started with a straight wall. And so I guess what’s profound to me is that without the wall I might not ever have noticed or been able to access these lines. Even as I take this photo the window reflects upon the lines and doesn’t allow them to be the mountains that I am trying to make them be and instead interferes, showing them, almost, where they might have come from. Pardon my eyes. I tend to leave them places and walk away and then they’ll show up again, and there I’ll be, looking back at myself. I’ve been trying to reconcile history. That’s where it all began. I was trying to understand how I am related to my architecture. And the practice that has been most interesting to me, the modality, has been not in moving my body necessarily, or rather – from moving my body, it has been about this ability to cut myself out. To cut out the shape that I make and to see it as a shape with multiple possibilities. Impossible possibilities. And it’s consonance with other shapes that it has never seen, or touched, or known of before. This random, unpredictable consonance, tells me that maybe it’s not ever fixed. Tells me that new shapes are always possible and impossible to know without doing. 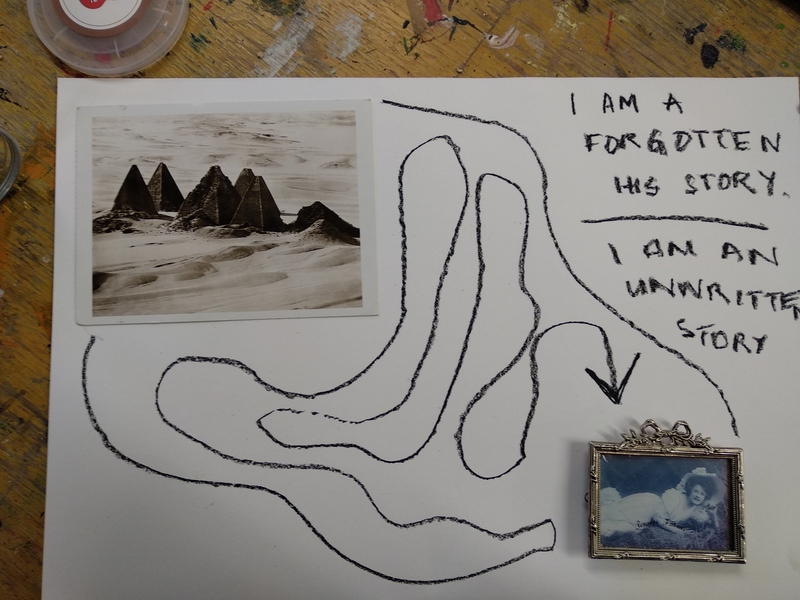 It goes back to those first words from my postcard, which are that ‘I am an unwritten history’, correction, ‘I am a forgotten history, and unwritten story’, as content-in-process would have it, that I am an unwritten history. I think this is the thing that gives the most strength is that i write not only my future but my history. it is not for someone else to say the narrative that I am created from or that there are expectations on the shape and behaviour and meaning of that narrative, it is just a frame and just like what Timothy Morton says about a poem, and one line of a poem not being able to capture a whole poem, or one word not being representative of a greater whole necessarily, but being a piece or a part that has infinite expressions or possibilites, this frame now appears to me as the way in which we write history. How I frame myself starts to become my ability to co-create not just a future but a past, accessed only through constantly giving this moment the privilege of being unknown. Freedom. I really enjoy now looking through these images and seeing these eyes everywhere. They just keep reminding me of myself looking back, or looking forward, but looking. Of being equally as surprised as I am when these new images, shapes, stories, lines, as they form themselves. Throughout the process of speaking the above, I create a new collage work. The images I take become part of the video in my presentation and the final work represents a reduction of the various stages of the process, digitally altered and refined. Separately, I create a piece entitled Body/Wall_Encounters, reflecting the experiments that I have undertaken as part of this research work that still hold curiosity for me.